New research reveals that when two parts of the Earth's crust break apart, this does not always cause massive volcanic eruptions. The study, published today in the journal Nature, explains why some parts of the world saw massive volcanic eruptions millions of years ago and others did not. The Earth's crust is broken into plates that are in constant motion over timescales of millions of years. Plates occasionally collide and fuse, or they can break apart to form new ones. When the latter plates break apart, a plume of hot rock can rise from deep within the Earth's interior, which can cause massive volcanic activity on the surface. Researchers had previously believed that the temperature of the mantle beneath a plate was the key to determining the level of volcanic activity where a rift occurred. 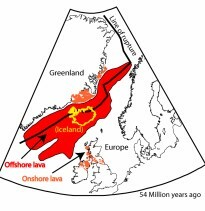 The new study reveals that in addition, the prior history of a rift also strongly influences whether or not volcanic activity will occur along it. In the case of the break-up of America from Europe, massive volcanic activity occurred along the rift because a previous geological event had thinned the plate, according to today's study. This provided a focal point where the mantle underneath the plate could rapidly melt, forming magma that erupted easily through the thinned plate and onto the surface, in massive outbursts of volcanic activity. In comparison, when India broke away from the Seychelles very little volcanic activity occurred along the North Indian Ocean floor, because the region had experienced volcanic activity in a neighbouring area called the Gop Rift 6 million years earlier. This exhausted the supply of magma and cooled the mantle, so that when a rift occurred, very little magma was left to erupt. Dr Jenny Collier, co-author from the Department of Earth Science and Engineering at Imperial College London, says: "Mass extinctions, the formation of new continents and global climate change are some of the effects that can happen when plates break apart and cause super volcanic eruptions. Excitingly, our study is helping us to see more clearly some of the factors that cause the events that have helped to shape the Earth over millions of years." The team reached their conclusions after carrying out deep sea surveys of the North Indian Ocean to determine the type of rock below the ocean floor. They discovered only small amounts of basalt rock, which is an indicator of earlier volcanic activity .The team also used new computer models that they had developed to simulate what had happened along the ocean floor in the lead up to India and the Seychelles splitting apart. Dr John Armitage, lead author of the paper from the Department of Earth Science and Engineering at Imperial College London, adds: "Our study is helping us to see that the history of the rift is really important for determining the level of volcanic activity when plates break apart. We now know that this rift history is just as important as mantle temperature in controlling the level of volcanic activity on the Earth's surface." In the future, the team hope to further explore the ocean floor off the coast of South America where that continent split from Africa millions of years ago to determine the level of ancient volcanic activity in the region.